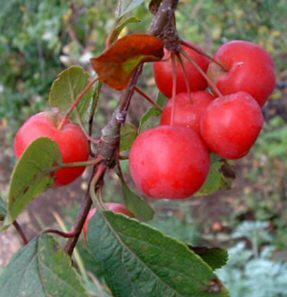 Harry Baker (Malus 'Harry Baker') is a very special flowering crab apple variety with exceptionally large, rich, flamboyant pink flowers. It carries dark green-maroon leaves followed by large ruby red fruit with a deep pink flesh lasting into mid October. High in pectin making a superb deep red jelly. First introduced in the United Kingdom.